We welcome visitors to the reserve! We are open daily from 9:00 am until 5:00 pm. If you plan to stay overnight please contact Ceiba’s office in the United States or in Quito to make a reservation. The biological station has room for up to 24 people, with all meals provided Monday through Friday. We can accomodate day and overnight visitors, researchers and volunteers. The reserve’s EcoCenter can be contacted during business hours by calling 99-238-2193 (when calling internationally, dial +593-99-238-2193). 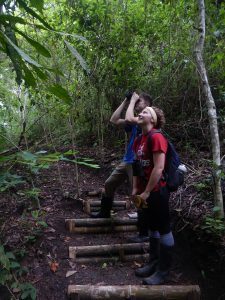 Volunteers and interns play an integral role in the success and advancement of conservation and environmental education efforts at the Lalo Loor Reserve. You may spend a week to several months enjoying the beautiful coastal surroundings of the region while contributing to ongoing research and maintenance at the reserve. Visit our Get Involved page for more details on projects. We also host researchers interested in studying tropical dry forests. Learn more about how to apply. At the entrance to the “Bosque Seco Lalo Loor” or Lalo Loor Dry Forest reserve is our unmistakable, round, yellow EcoCenter where you can find information about the flora and fauna in the reserve, and the surrounding area. The ecology and culture of coastal Ecuador is featured. The EcoCenter is your jumping off point for the 11 km of trails that reach some of the forest’s most attractive features, including ecologically distinct wetter and drier forest types, large fig trees and beautiful ephemeral streams. Views of the surrounding forest, clouded hillsides, and the gorgeous Pacific Ocean can be enjoyed from the reserve’s scenic overlook. A hike through the forest offers excellent birdwatching and a chance to see monkeys (Ecuadorian White-fronted Capuchin monkey and Mantled Howler monkey), and other mammals (Jaguarundi, Tamandua, Collared Peccaries, Boa constrictor) as well as many frogs and lizards. See our complete species lists! In the rainy season the trails can be muddy, so we have rubber boots available for visitors to use. The new biological station was completed in 2016. It provides rustic but comfortable accommodations for visitors, researchers, volunteers, and student groups. The station house is nestled in the forest, and can sleep up to 26 people in six cabins with four bunk beds each, plus one double room. Rooms have screens and beds are equipped with mosquito nets. Three delicious meals a day are served from Monday-Friday in our cozy dining room, featuring Ecuadorian fare as well as cosmopolitan favorites. Relax in a hammock and listen to the sounds of the forest. There are separate dry composting toilets and showers a few steps from the dormitory. Enjoy the experience of living off the grid; light in the evening is provided by candles! 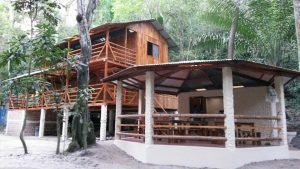 In the morning you’ll be woken up by the sound of Howler Monkeys that sleep in the trees nearby. To make a reservation, check our current rates for individuals and groups, then contact Ceiba to arrange your visit! The Lalo Loor reserve receives many local and foreign school groups, and also provides a variety of workshops for the community. To that end, we have an airy, bamboo classroom with electric power. The room can accommodate up to 40 people. We have a projector, white board, tables and chairs available for your group — just let us know what you need!